Balancing your chemistry is one of the most important and easy pool maintenance tool to have in your toolbox! Your pool water is always coming into contact with different outside factors; dirt, oil, cosmetics, etc. Balancing your chemistry is important to keep your pool looking clean and clear all year round. In this post we will go over basic pool chemistry, what chemicals to look for and what to do if any are higher or lower than what they should be. First and foremost is to get a good chemistry kit. This is the one we use and highly recommend for a pool owner. The test strips tend to give an inaccurate reading and should only be used by a professional who knows your pool’s chemistry well. If chlorine is below the ideal level simply add by what means you have, chlorine floater, or chlorinator. If you have a salt cell chlorine generator we will cover that in another blog post. If chlorine is above ideal level there is no need to add or take away anything. Chlorine is the chemical that is most used in pools and will vary week to week. If your Ph is too basic, example 8.0, you can adjust by adding muriatic acid to the pool water directly. (Note never add this directly over steps in the pool). If your Ph is too acidic, example 7.0, then add soda ash to the water directly. To adjust your alkalinity you will only ever add sodium bicarbonate to bring these levels up to the ideal range of 80 – 120 ppm (parts per million). This is a fine powder that is added to the pool water directly and can either be brushed to dissolve or vacuumed up. 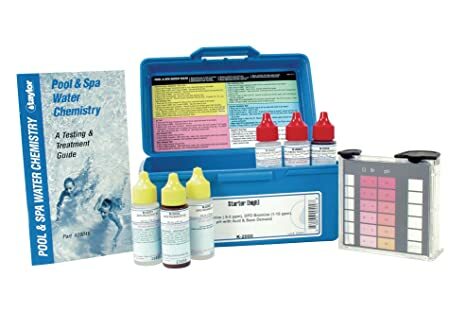 To keep your pool looking clean and clear all year round, use a test kit to test your pool’s chemistry keeping within the acceptable ranges for each chemical. There are more chemicals to be tested for but the ones we showed are the most important to keep in range and properly balanced. You can go to your local pool supply store to pick up any of these chemicals to add to your pool. How often do you check your pool’s chemistry? What chemistry test kit is your favorite?